On Sunday we went for a late lunch to Mosman. 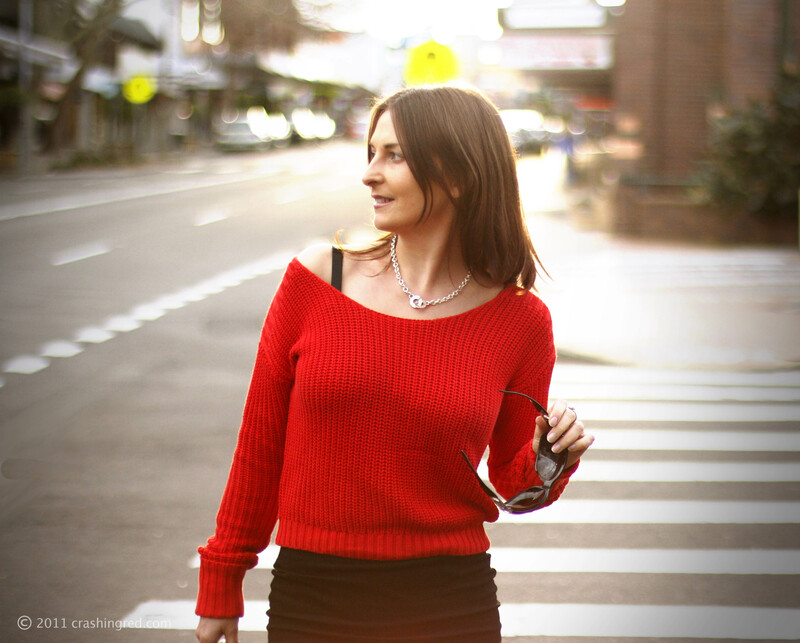 Whether because of grey wet after rain streets or majority of people wearing dark colors but my red casual jumper really stood out. It became some kind of a statement: CrashingRed against grey streets :) Yet the outfit itself was simple: jumper, tube mini skirt, booties and a minimum of accessories, it was a contrast between red and black that made the look. Surely, you are aware that color is one of the main fashion trends for the next season. I guess this post can be a good example of how to work color trend in real life. Just add one bright piece (bag, shirt, shorts or in my case jumper) and keep the rest of the look understated. Even though I declared my love for bright colors long time ago, I think green-red-yellow traffic lights combos are more appropriate for runways and fashion blogs rather than for reality. What about you lovelies? Did you wear color? WILL you wear color? I LOVE colour, especially red. Been adding touches of red to my outfit since goodness knows when. :) I think it’s nice especially with Melbourne always having a dark colour trend going on, to have bright bold colours in the mix. WOow this cocktail of Black § Red truly suits you perfectly (very “casual GLAMazon”), AND the skirt’s flirtatious shape combined with the matching bra achieve to make all the “Trendy difference” I must add Dear !!! I really love black and red color together. Always chic!! I really like red on you. the momonet i saw this post of yours i thought of the song ”pretty woman” the o.s.t of the movie…you look so beautiful in red!!! You look amazing in red and your legs are looking awesome!! I love colour! Colour is just so much fun. You look gorgeous!